The Lexbe Platform is purpose-built for boutique law firms involved in complex litigation. Cloud-based, lightning fast and highly affordable, the Lexbe Platform equips you with critical capabilities to handle large document cases, including the Uber Index, integrated language translation, near-dupe and TAR delivered via a very simple and intuitive user interface. The Lexbe Platform is Microsoft, Apple and Android compatible. Pricing starts at just $25/GB/Month with no commitments. Pros: *Lexbe has very responsive customer support. Cons: *It is not an easy to pick up software, particularly for running productions. 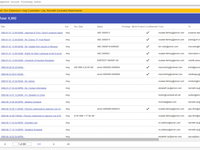 Overall: Lexbe can be a great & inexpensive way to handle a good sized document case and review/sort/tag documents for easy grouping and call back. It can be glitchy and you need to get significant training to really be able to maneuver the software but once you learn, it is a asset! 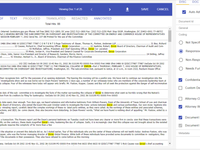 Pros: The automatic OCR function, which makes high volumes of documents easily searchable, coupled with the degree of customization for tagging and the ease of sharing cloud-hosted documents among team members makes Lexbe a stellar tool for analyzing, organizing, and collaborating on case document collections, no matter how vast the universe of documents. Cons: The production features could be improved. Namely, the privilege marking, placeholder production when encountering incompatible document formats or otherwise problematic files, and the length of time it takes for the system to process and Bates stamp a production can be frustrating, time consuming, and occasionally lead to discovery disputes between parties. Pros: Some of the great advantages of using Lexbe include vast data types supported, multiple options for data processing and production, and a user friendly interface allowing for easy document review. Lexbe offers amazing customer support including training and monthly webinars as well as a very knowledgeable staff that goes out of the way to meet your firm's needs. They also offer great rates to be flexible with your firms storage needs and no additional charges for uploading and other common fees that you would incur if using a competitors platform. Cons: Depending on site traffic, data formats, and file sizes sometimes the data processing can be slightly time consuming for uploading collections or downloading productions. However, this is the case with any program and the Lexbe support experts are very helpful in moving the process along. Overall: The software is very helpful in making Discovery easy for processing, review and production. It allows me to easily handle most jobs individually with the option of offering services to assist on larger or more difficult cases. Pros: Easy to load documents. Different formats to view documents including native. Support is great, but you shouldn't have to pay for it and if you are going to be charged, they should tell you before you incur a charge. Cons: Method of review is confusing. 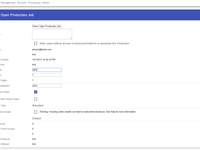 Production screen should be one screen, not having to go between 2 different tabs on the browser. Don't like the placeholders -too many, too confusing. Overall: Not sure which software this survey refers to - the one I signed on to rate or the software hosting the survey. Pros: It's relatively easy to use. Sometimes it runs very fast. Easy to upload files. Easy to make folders and tags. Cons: Buggy. Sometimes slow. Has functionality flaws that sometimes make it difficult to use. For example, you can't redact things that are larger than the normal size paper, bc the redaction viewer is too small. Pros: I like that the program processes the data at a rapid pace while grouping emails and attachments together. It makes reviewing documents easier with many shortcuts! Cons: Too many clicks in the document review process. The way the platform looks now is not appealing to the eye. * Value. Lexbe is a very inexpensive and cost-effective e-discovery solution, such that even solo practitioners and small law firms can use it on a day-to-day basis without breaking the bank. * Functionality. The platform has all the features one needs to satisfy basic ESI processing/production needs, and most of the advanced features of its larger competitors. * Speed. Lexbe has a very quick turnaround on processing, searches, and production runs. * Mobility. 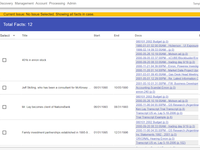 Because Lexbe is a hosted solution, a user can search for and retrieve documents from anywhere (which comes in very handy when one needs a document on the fly, such as during a deposition or hearing). * Support. Lexbe staff respond to inquiries quickly and knowledgeably. * Contextual help links. Lexbe's Help link immediately pulls up support articles related to what the user actually sees on his or her screen. While this feature may sound simple, this eliminates the headaches of trying to find the right help article for a problem. * The Lexbe interface is not as aesthetically pleasing or intuitive as many competitors. Pros: Being able to control my own database! Uploading my documents and being able to work in the database on my time, with no vendor related lag time. Lexbe is very user friendly and cost effective. Cons: Adobe fillable forms and certified signature forms won't load into the viewers. Unfortunately, you don't know how many of those you have in a data set until after they are loaded and processed with place holders. But Lexbe allows you to easily run a report to identify those problem documents. Overall: I am able to quickly, efficiently and cost effectively handle my own e-discovery needs! Pros: I love being able to contact Lexbe whenever I have any questions. Their customer service team is incredibly nice, quick, and helpful. Cons: Some parts of the platform are not immediately intuitive but pretty easy to learn over time. It can be a little harder to learn for people who aren't used to working on computers all the time. Overall: We can easily store and find all the documents from our many cases and access them instantly from different computers. Finally moved us away from emailing documents to each other or storing them on several flash drives. Pros: Being able to upload our own cases and documents, knowing we have almost full control to work in the portal independently so we won't be charged if we don't want to be for professional service hours. 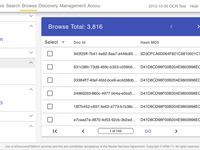 Automatic OCR and the search abilities have significantly enhanced our e-discovery process. Being able to unredact redactions that we had previously made. Cons: The only minor thing we don't like is that the redaction boxes are white/"x" and not black. We prefer black but that's a personal preference point. We've also already submitted a feature request, which is really nice that Lexbe takes user feedback seriously. Thank you for the review and suggested feature request! We take client feedback extremely serious as our main goal is to make the Lexbe eDiscovery Platform as user-friendly as possible. We will contact you once the feature request has been designed, tested and released. An excellent platform for a mid-size law firm with an excellent price point and customer service. Pros: Ease of uses, very logical organization of data and tasks. Searching is easy and all work from ingestion to production can be done in-house. Cons: The custom was tagging is difficult to work with, easy once you work with it for a bit, unfortunately, you aren't able to organize them. Kristine, thank you for the review. We have made some updates to our custom tag management page and all custom tags can be moved and edited after creation. We have also made an update that allows for creating custom tag and sections 'on the fly' from the Browse and Search pages. We hope you find these updates helpful! Only use Lexbe for one case right. Document review is relatively easy. Pros: The redaction function is straightforward and easy to use. Production is also efficient and not too complicated. Cons: There is a limit to the size of documents you can upload at once into the system unless you want to pay more for it. This causes the documents to be divided up into different groups and hard to maintain. Scott, thank you for the review. The DIY upload via drag and drop is dependent on size and user's network settings. We don't have a limitation on the size of documents that can be uploaded. The Browse screen will display all documents in the case and there are several ways to organize and group documents besides upload batch--Custodians, Doc Source, Custom tags, etc., all of which can be filtered for on the Browse screen. In the event that you have a bulk data set that requires to be uploaded as one batch, please feel free to reach out to our Professional Services staff as they can perform the upload on their end. If you have a Subscription plan, standard uploads are free and handled by Lexbe Professional Services. You can send us your drive, FTP, etc. Pros: It's easy to use, free processing and excellent customer support. Overall: Our company first heard of Lexbe through a referral and we contacted them to help us with our litigation. Recommendations to other buyers: They have translation and offer consulting and assisted review. Pros: I like that Lexbe allows my team to download, process, organize, and review a very, very large number of files without feeling overwhelmed. Cons: While this is a wonderful software, the price point is what I like least about this program. Is there anyway to reduce this? Marissa, thank you for the review! Lexbe offers a wide variety of plans to meet the diverse needs of our clients. Month to month plans are available as are contracted plans which are heavily discounted. We also offer a prepaid discount and have Subscription plans that include free Professional Services hours for standard uploads. Please feel free to contact Lexbe Sales to learn more about the plans we offer and find one that best suits your needs. A very user friendly platform that's easy to navigate. Pros: The layout it easy to follow and can quickly browse all the cases for the firm. Uploading documents is a breeze and running productions is fast and easy. Paralegal for the past 10 years; Lawyer for 5 years before that. Pros: Ease of use; availability of knowledgeable support and professional services; increased productivity for the firm in terms of document review, etc. Pros: Easy to use with so many documents to review, customer service is amazing, the features are easy to use and figure out if you are not computer savey. Pros: It was self explanatory and wasn't hard to figure out what you were looking for. I like that it is secure and no worries. And if you have problems no matter what time you have consultants available to help you. Cons: I didn't really find anything I didn't like yet. I haven't been using it that long. Pros: Easy to use and function. Easy to understand the directions to help you through. They spoke clear and understood what they were saying. Overall: It will help me more during my work day, which will make work less stressful. Thanks.